Caila, a former The Bachelor bachelorette from Hudson, OH who currently resides in New York, has apparently fallen in love with Nick, a private equity real estate investor from Chicago, IL. 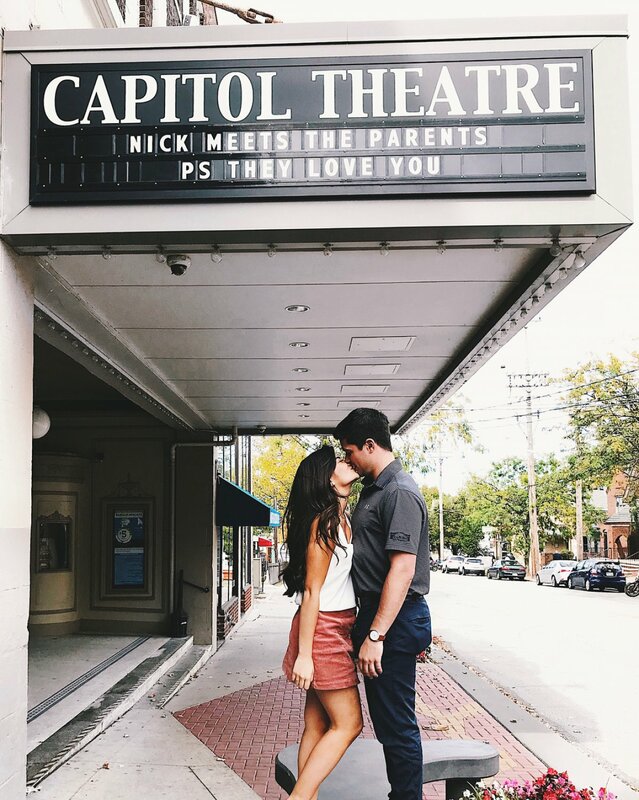 Earlier this week, Caila shared a photo of Nick and herself kissing underneath a classic movie theater banner in Cleveland, OH, that read: "Nick Meets the Parents. PS They Love You." The photo was captioned by Caila, "Now playing in a theater near you." In a separate video Caila shared, the couple was strolling hand-in-hand and exchanged kisses before she surprised him with the adorable customized sign. Nick's reaction was priceless, as he was both shocked and flattered by the gesture. Caila revealed to Entertainment Tonight that the pair were set up through a mutual friend a few weeks ago. "[Our connection] definitely was instant. He entered the New York City bar after I just finished up with a Fashion Week event, and that was it. I was hooked. It's actually really cute. He says it all the time but, 'When you know, you know,'" Caila gushed about her new man. The aspiring lifestyle blogger called Nick "literally the sweetest human in the world," and added that she's very attracted to the fact he's "a big family man." "The way a guy talks about his parents says a lot about how he prioritizes his relationship. For him, it's family first," Caila explained, adding that she loves how Nick is "driven, goofy, adventurous and passionate." And "he makes me smile, nonstop," she noted. "He has this charismatic and caring presence that makes everyone at the party feel welcome." The couple has only been dating for a short period of time, but Nick has obviously already met her parents, and she said the gathering went "so well." "They absolutely love him," Caila told ET. "They even mentioned they've never seen someone make me this happy." Caila, however, said she isn't looking to rush into things with Nick even though she's clearly head over heels for the handsome guy. "It's a little soon for the next step talk," Caila admitted. "But I am definitely smitten and enjoying all the little firsts we're having together." Caila has had the last year off from reality TV after appearing on The Bachelor and Bachelor in Paradise in 2016, and she has apparently enjoyed finding love off-screen. "Dating outside of the Bachelor family is refreshing, we'll just leave it at that," the perky brunette beauty confessed. But Caila is still very grateful for her time on The Bachelor franchise, because without ever having entered the spotlight, she probably wouldn't have met Nick. "The girlfriend that set us up is a blogger, and if I didn't go on the show and change career paths, I would have never met her. She might have never introduced me to this amazing man. Everything happens for a reason," said Caila, a former software sales representative. Caila first competed for Ben Higgins' heart on The Bachelor's 20th season, but he eliminated her right after his round of overnight Fantasy Suite dates in favor of eventual runner-up JoJo Fletcher and winner Lauren Bushnell, from whom he split in May 2017. Caila, who was 24-years-old at the time Ben broke up with her, was blindsided, crushed and sent home before a Rose Ceremony in Jamaica. "I thought I'd be getting engaged in a week-and-a-half. I was ready," Caila said in tears following her ouster. "I was ready to get married. I was ready to be his wife. I was ready. I was ready for our future. It's all I thought about. My purpose in life is to love other people and I don't know why I haven't found it yet. I thought this was it. I thought this was it. I was ready. I didn't see this coming. I love him, too. Like, I still love him." That same year, Caila appeared on Season 3 of Bachelor in Paradise and left the show still dating Jared Haibon. Caila even met Jared's family in Rhode Island, but she revealed during an August 2016 episode of After Paradise that "mystical forces" contributed to their split. Jared's tight friendship with a very jealous and possessive Ashley Iaconetti seemed to be the reason behind his split with Caila about six weeks after filming wrapped.